http://www.JewishWorldReview.com | This week the Bush Administration legitimized Arab anti-Semitism. In an effort to please the Saudis and their Arab brothers, the Bush administration agreed to physically separate the Jews from the Arabs at the Annapolis conference in a manner that aligns with the apartheid policies of the Arab world which prohibit Israelis from setting foot on Arab soil. Evident everywhere, the discrimination against Israel received its starkest expression at the main assembly of the Annapolis conference on Tuesday. There, in accordance with Saudi demands, the Americans prohibited Israeli representatives from entering the hall through the same door as the Arabs. At the meeting of foreign ministers on Wednesday, Foreign Minister Tzipi Livni called her Arab counterparts to task for their discriminatory treatment. "Why doesn't anyone want to shake my hand? Why doesn't anyone want to be seen speaking to me?" she asked pointedly. As she put it, "I know what it is like to hear that you cannot go on a road or through a checkpoint because you are a Palestinian. I understand the feeling of humiliation and powerlessness." Rice's remarks make clear that for the Secretary of State there is no difference between Israelis trying to defend themselves from a jihadist Palestinian society which supports the destruction of the Jewish state and bigoted white Southerners who oppressed African Americans because of the color of their skin. It is true that Israel has security concerns, but as far as Rice is concerned, the Palestinians are the innocent victims. They are the ones who are discriminated against and humiliated, not Livni, who was forced - by Rice - to enter the conference through the service entrance. The Bush administration's tolerance for discrimination against Israel was not merely ceremonial. Diplomatically the conference was equally prejudicial. At Annapolis, the US joined the Arabs in placing the lion's share of blame for the absence of peace between Israel and the Palestinians on Israel. But you wouldn't know that from listening to Olmert, who is working steadily to hide what happened there. Olmert obfuscates the truth because his political stability rests in the hands of his hawkish coalition partners Yisrael Beiteinu and Shas. Both warned before the summit that if Olmert made any concessions on either Jerusalem or the so-called outpost communities in Judea and Samaria they would bolt his coalition and so spur new elections. Shas and Yisrael Beiteinu expressed satisfaction with the outcome of the summit. Both Shas leader Eli Yishai and Yisrael Beiteinu leader Avigdor Lieberman dismissed Annapolis as a pathetic joke and claimed that there is no reason for them to resign from the Olmert government. But their assertions are deliberately misleading. The fact that the Israeli-PLO joint statement made no specific mention of Jerusalem, and the government didn't announce a timetable for destroying the so-called outpost communities and expelling the hundreds of Israeli families who live in them doesn't mean that Israel made no concessions on these issues. In fact, the Olmert government made massive concessions on these issues. The Israel-PLO joint statement at Annapolis contains a joint pledge "to propagate a culture of peace and nonviolence; to confront terrorism and incitement, whether committed by Palestinians or Israelis." Although Olmert, Lieberman and Yishai dismiss this Israeli acceptance of moral equivalence with Palestinian jihadists as a meaningless rhetorical concession, the government's move is rife with political and legal implications. US Ambassador Richard Jones' unprecedented meeting this week with Supreme Court President Dorit Beinisch made clear that the US demands that Israeli courts interpret Israeli law in a prejudicial manner in order to demonize Israeli opponents of Palestinian statehood and the ethnic cleansing of the Jews from Judea and Samaria. Their meeting also signaled that the US expects Israel to treat lawful building activities by Jews in Judea and Samaria and even in sections of Jerusalem as criminal acts. Since the Olmert government accepts that Israel is morally indistinguishable from the Palestinian Authority, it is hard to foresee it preventing the criminalization of its political opponents. From now on, Israelis who oppose the diplomatic moves of the Olmert government can expect to be treated as the moral equivalents of Palestinian terrorists. At Annapolis the Americans accepted the role of sole arbiter of Israeli and Palestinian compliance with their commitments to the so-called Roadmap and the peace process. They also committed themselves to reaching a comprehensive peace treaty by the end of 2008. But as former US Middle East mediator during the Clinton administration Dennis Ross has admitted, these goals are contradictory. It is impossible to both ensure Palestinian compliance and the achievement of a peace treaty in that timetable. Writing in the *Washington Post* after the Oslo peace process collapsed at Camp David and the Palestinian jihad had begun, Ross explained, "The prudential issues of compliance were neglected and politicized by the Americans in favor of keeping the peace process afloat�.Every time there was a behavior, or an incident, or an event that was inconsistent with what the peace process was about, the impulse was to rationalize it, finesse it, find a way around it, and not to allow it to break the process." "What the peace process was about" for the Clinton administration was signing peace agreements. 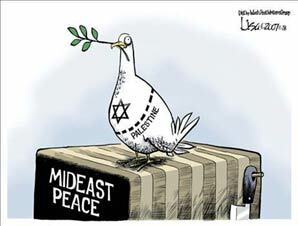 It was not about ensuring that the Palestinians were actually interested in living at peace with Israel. When Rice stated that "failure is not an option," in the coming peace process, she made clear that the same is the case for the Bush administration today. She wants an agreement. Whether the Palestinians are serious about peace or not is none of her business. Although reporting on Palestinian non-compliance with their commitments to fight terror will harm prospects for speedy "progress," accusing Israel of filching on its commitments will actually speed things along. Alleging Israeli non-compliance will force the pliant Olmert government to make further concessions to the Palestinians. In light of this, it is clear that contrary to Yishai and Lieberman's dismissive treatment of what happened at Annapolis, Olmert's acceptance of the Americans as both judge of compliance and guarantor of "progress" means that Israel already made massive concessions. On Jerusalem for instance, although Yishai is right that Jerusalem is not specifically mentioned in the joint statement, the fact is that Israel agreed to negotiate the status of its capital city by agreeing to discuss all outstanding issues. Since the Americans want a Palestinian state within a year and they know that Palestinian Authority Chairman Mahmoud Abbas will not make any concessions on Jerusalem, they can be expected to pressure Israel to accept the Palestinian position. The thousands of Arab Jerusalemites now applying for Israeli citizenship are a clear sign that the Arabs understand that Israel has already made massive concessions on the city. And Yishai must know this. The American status as arbiters of compliance has far reaching implications for Israel's ability to cope effectively with the security situation in Gaza and the Western Negev. Since Hamas seized control of Gaza in June, Abbas has opposed any wide-scaled IDF counter-terror offensive on the area. Abbas has claimed - probably rightly - that an Israeli ground offensive in Gaza would weaken his position in Palestinian society since the Palestinians support Hamas's positions more than they support him. Given that the Americans are committed to strengthening Abbas, it is obvious that they will veto any Israeli plan to conduct an offensive in Gaza aimed at restoring security to the Western Negev. Then there is Judea and Samaria. Lieberman claims that he can remain in the government because Olmert has yet to announce a timetable for throwing the Jews out of their homes in the so-called outpost communities. But that isn't Olmert's responsibility anymore. He ceded it to the Americans at Annapolis. They will set the timetable for expulsions, not Olmert. And it isn't only the Israeli communities in Judea and Samaria that are now at risk. By anointing the State Department arbiter of Israeli compliance, the Olmert government gave the Americans the right to veto IDF operations in Judea and Samaria. As the guarantors of progress in the peace process, the Americans will tell the IDF where it can - or more precisely where it cannot - erect roadblocks. The Americans will tell the Israelis what cities and towns to transfer to Fatah control. They will tell Israel what guns and armor to transfer to the Palestinians, what to do with terror fugitives and when and how many terrorists it must release from its prisons. Actually, the US has been constraining Israel's counter-terror operations in Judea and Samaria for months now. That these American efforts have harmed the effectiveness of the IDF's operations is something that Ido Zoldan's widow can attest to. Zoldan after all was murdered last week by Fatah terrorists who owed their ability to move about freely to Israel's decision to bow to American pressure and dismantle 24 roadblocks and curb its efforts to arrest Fatah terror bosses. In essence what we see in Olmert's and Livni's machinations is a repeat of Ariel Sharon's and Livni's political maneuvering in the period that preceded the withdrawal from Gaza. In both cases, Israel's senior leaders abide by the basic political understanding that a fight postponed is a fight won. In 2004 Sharon lacked the political strength to announce openly that he was going to completely withdraw from Gaza and destroy all the Israeli communities in the area. So he allowed the Likud to hold a referendum on his plan to withdraw and authorized Livni to draft the so-called compromise plan according to which the destruction of Israeli communities would take place in four stages over several months and that each stage would require separate government approval. By the time the Likud rejected his plan, Sharon was strong enough to ignore the will of his party. And when the withdrawal took place, far from taking place in four stages, it took place in four days. Livni and Sharon could ignore their previous commitments because when the time came to pay the piper, they had already destroyed their opponents. Today, by pretending that the joint declaration at Annapolis was a big nothing, Olmert and Livni are repeating the maneuver. By the time they start throwing Jews out of their homes, they won't need Shas or Yisrael Beiteinu anymore. Lieberman and Yishai are under no obligation to leave the government. They can stay for as long as they like. But they cannot pretend that by staying they are not full partners in the government's policies. As Annapolis made clear, those policies include dividing Jerusalem, destroying the Israeli communities in Judea and Samaria and compromising the security of the State of Israel.